London: Chatto & Windus, 1972. First English edition of the author’s first book. Octavo, original cloth. 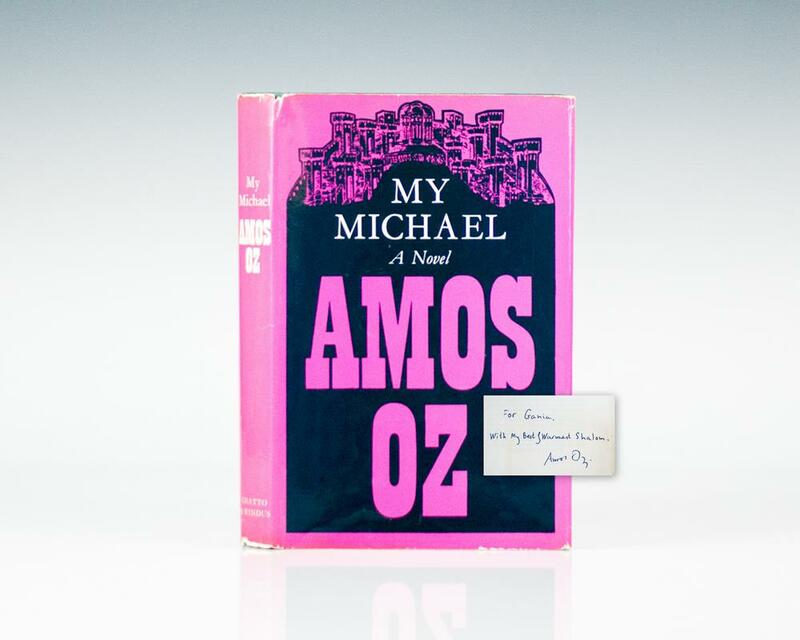 Presentation copy, inscribed by the author on the front free endpaper in a contemporary hand, “For Gania, with my best wishes and warmest shalom, Amos Oz.” Bookplate, near fine in a very good dust jacket with a few small closed tears and wear to the spine. Translated from the Hebrew by Nicholas de Lange. The New York Review of Books wrote of My Michael that it is "a dazzling, very beautiful, splendidly conceived and composed book." Set in 1950s Jerusalem, it tells the story of a remote and intense woman named Hannah Gonen and her marriage to a decent but unremarkable man named Michael. As the years pass and Hannah’s tempestuous fantasy life encroaches upon reality, she feels increasingly estranged from him and the marriage gradually disintegrates. Gorgeously written, profoundly moving, this extraordinary novel is at once a haunting love story, and a rich reflective portrait of a place. "Thoughtful, self-assured and highly sophisticated, full of the most skillful modulations of tone and texture. A modern Israeli Madame Bovary" (New York Times Book Review). It has been adapted into a movie, in Hebrew. The Bertelsmann publishing house named it among the one hundred best novels of the 20th century. London: Chatto & Windus, 2004. First edition in English of “one of the most enchanting and deeply satisfying books”(The New Republic). Octavo, original boards. Boldly signed by Amos Oz on the title page. Fine in a near fine dust jacket. Jacket design by Stephen Parker. Translated from the Hebrew by Nicholas De Lange. Touch the Water Touch the Wind. Harcourt Brace Jovanovich: New York, 1973. First edition. Octavo, original half cloth. Signed by Amos Oz on the half title page. Near fine in a near fine dust jacket. Translated from the Hebrew by Nicholas de Lange. First American edition of the author’s first book. Octavo, original cloth. Signed by Amos Oz on the title page. Fine in a near fine dust jacket with light rubbing to the extremities. Jacket art by Muriel Nasser. Translated from the Hebrew by Nicholas de Lange.